Prime Minister Sheikh Hasina may discuss on Teesta water issue and Rohingya crisis at Shantiniketan of India during a meeting with Indian Prime Minister Narendra Modi and West Bengal Chief Minister Mamata Banerjee. The meeting will be held at Bangladesh Bhaban in Santiniketan. The Prime Minister leaves dhaka for Kolkata on Friday on a two-day official visit to India at the invitation of her Indian counterpart Narendra Modi. Hasina is going to India mainly to inaugurate Bangladesh Bhaban and take part in the convocation of Kazi Nazrul University, Asansol on May 26. During the visit, the premier will attend the Visva Bharati University Convocation at Shantiniketan as the guest of honour and will receive honorary Doctor of Literature (D.Litt) Degree from Kazi Nazrul University at Asansol in West Bengal. Sheikh Hasina and Narendra Modi will jointly inaugurate the newly constructed Bangladesh Bhaban at Shantiniketan and hold a meeting there. A Biman Bangladesh Airlines VVIP flight carrying the premier and her entourage members will take off from Hazrat Shahjalal International Airport here for Kolkata on Friday morning. The flight is scheduled to reach Netaji Subhash Chandra Bose International Airport in Kolkata at 9 am local time. After the reception at the airport, Sheikh Hasina will go to Shantiniketan near Bolpur in Birbhum district of West Bengal, approximately 180 km north of Kolkata by a helicopter. The Bhaban has a modern theatre, display room, a large library for books on literature, culture, history and liberation war of Bangladesh and India, and books on Bangladesh-India relations. Besides, two big murals of Father of the Nation Bangabandhu Sheikh Mujibur Rahman and Biswa Kabi Rabindranath Tagore have been set up at the two ends of its entrance. 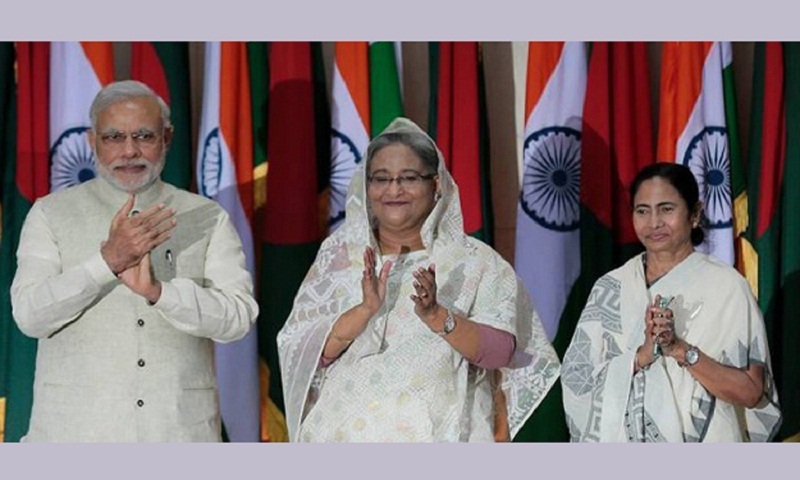 After the inaugural ceremony of Bangladesh Bhaban, Sheikh Hasina and Narendra Modi will hold a meeting there. Issues of bilateral interest and international concerns are expected to come up for discussion. On Saturday, the prime minister will go to Kazi Nazrul University at Asansol where she will be conferred with the honorary D. Litt Degree at a special convocation there. From Shantniketan, the Bangladesh prime minister will return to Kolkata and will visit "Jorasanko Thakur Bari", the residence of Poet Rabindranath Tagore. Besides, veteran Indian actress Sharmila Tagore will also be honoured with D Litt, while renowned physicist SM Yusuf of Bhabha Atomic Research Centre will be conferred an honorary D Sc degree at the programme. Mamata Banerjee will be present at the convocation as the chief guest while West Bengal Governor Keshari Nath Tripathi will address the ceremony as the chancellor. From there, Sheikh Hasina will return to Kolkata in the afternoon and will visit Netaji Shubhas Chandra Bose Museum at Netaji Bhaban, the ancestral home of Netaji Subhas Chandra Bose, a great patriot of the freedom movement in India.